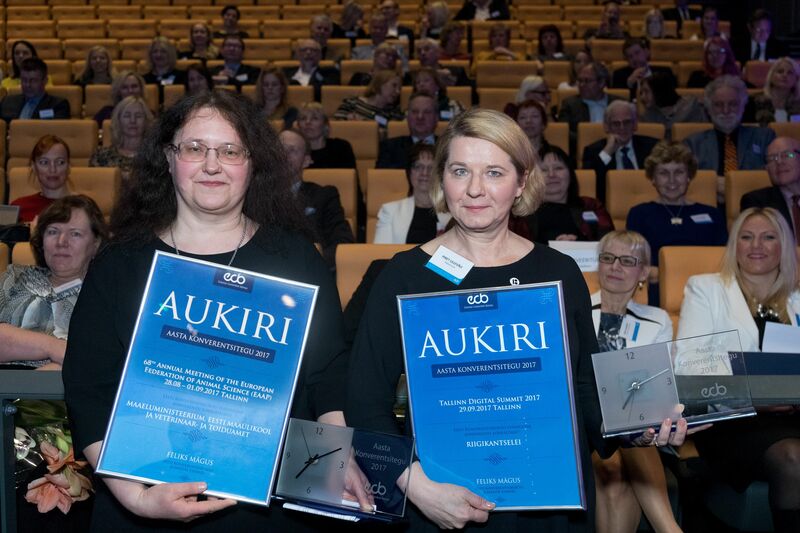 The Estonian Convention Bureau’s annual ‘Conference of the Year’ awards ceremony took place in Tallinn on February 6th, with the top prize going to two separate events: the Tallinn Digital Summit 2017 and the 68th Annual Meeting of the European Federation of Animal Science. The Digital Summit, organised by the Estonian Presidency of the Council of the European Union in cooperation with the President of the European Council and the European Commission, pulled in 1,500 participants, including many heads of state and government. Held at the Tallinn Creative Hub on September 29th, the summit served as a launching pad for high-level discussions on digital innovation and how to keep Europe ahead of the technological curve. The 68th EAAP Annual Meeting took place at the Nordea Concert Hall in Tallinn from August 28th to September 1st. The theme of this year’s event was a hot topic of the animal production industry: ‘Patterns of Livestock Production in the Development of Bioeconomy’. As many as 1,032 participants from 52 different countries attended the meeting, which was hosted by the European Federation of Animal Science with PCO Publicon handling local organisation work. Commenting on the unusual decision to award the prize to two different events, Estonian Convention Bureau Managing Director Kadri Karu pointed to 2017’s being an exceptional year for conferences due to Estonia’s EU Presidency and the unusually high number of scientific gatherings held. “In giving out two awards, the ECB members would like to recognize both the State Council for putting the EU Presidency together as well as the EAAP meeting organisers, who faced a special challenge in finding venues to fit more than 1,000 delegates in Tallinn. We appreciate the extra effort they made in hosting this congress here and we’d like to encourage others to do the same,” she said. The prize for the ‘Most Innovative Conference’ went to sTARTUp Day, a 3-day event held in January by the University of Tartu, the City of Tartu and the sTARTUp Community. A prize for ‘Successful Bidder’ went to all five nominees, hosts of major events taking place in Estonia from 2019 to 2021. The awards ceremony took place at the newly opened Film Museum, with awards handed out by Tallinn Deputy Mayor Aivar Riisalu and ECB Board Member Külli Karing. A separate ceremony for Tartu conferences will be held on February 8th at the University of Tartu Library. The ECB kicked off its ‘Conference of the Year’ award in 2011, with each year’s winners chosen by a vote of all its members.